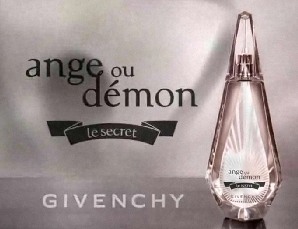 Givenchy will launch Ange ou Démon Le Secret, a new fragrance for women fronted by actress Uma Thurman, in August. Le Secret is a flanker to 2006's Ange ou Démon. Ange ou Démon Le Secret is a delicate floral developed by perfumer Bernard Ellena. The fragrance notes include cranberry, green tea, citrus, sambac jasmine, white peony, water flower (water lily? ), blond woods, white musk and patchouli. Cranberry, green tea and citrus? Sounds….. healthy! makes you smell fine and improves your urinary tract health! Uma seems to like it…. Is that just a picture of Uma or is that the ad? Er…she looks compressed…stature wise imho. Speaking of that…. When is Bernard and Marc going to finally give us that LUXURY Louis Vuitton Fragrance Set (Womens and Mens) that i have been hoping and waiting for???? Somebody needs to get on the ball there! Imagine Louis Vuitton for women in a Custom Carrying Case of the Monogram or Damier Check Canvas and the Bottles in Frosted Lalique Crystal with the Louis Logos all over them… what would it smell like…. Er, too much cheese for me. she’s still kibbitzing about it in the next room…. I don’t know that AoD sold well (just guessing)…seems curious that they’re bringing out the star power for the flanker & not the original. still, the notes are all wrong. The original is very Angels and Demons. Forgot to add this is the second flanker…the first was Ange ou Demon Tendre…didn’t care for it. Uma looks fab – my husband and I completely disagree on her looks; he thinks she is “oogly” (lol), I think she’s amazing looking. Re. the flanker – sheesh! I wear AoD in parfum form once in a great while, and it’s okay, but this sounds terrrrrrrrible. I think she’s gorgeous too. My stepmom got me a giant bottle of AoD a few years ago and I am slowly working my way though it. It’s not bad, and is wearable, but doesn’t have much to really recommend it. Not sure if I need to even try the flanker. I think Uma is gorgeous, too. Although that pic seems a bit High Glam for her. I didn’t much like it, but to be honest can’t remember it very well. I guess this is the “angels” over the “demons” scent. sounds like something I’d be interested in trying out, but so far haven’t found a Givenchy fragrance I like. I guess, although the original did not strike me as demonic in the least. Blond woods have more fun? Really? Her head looks normal to me. You’re sure right about the hemline, or lack thereof. AUD was bland and boring, just something without spirit but with a great name :))) All the flankers are just as boring and useless to me. they are “safe” fragrances , with a marketing focused on names, logos and botles ….Uma is nice but obviously, this fragrance aims to very young girls who until very recently have never stepped in a perfumery . Uma is connected to me to the time she was the face of the Miracle campaigne for Lancome. I don’t know about USA but back around 2000 Miracle was “in” in Europe and Uma was the Miracle face… Miracle was selling very well and all the glossy magazines had Uma posing for the fuchsia Miracle. I remember well the kind of pinkish box and the vendors explaining this is the last fresia scent embodied by Uma Thurman… We are probably living times when people don’t remember what it was like 2 years ago, lest 7,8 or 10 :)) So, I don’t like the original or this specific flanker and I honestly hope they will stop with this Ange ou Demon saga that says nothing to me. sorry for my English. I hope to write correctly what i want to. So, a few months ago my husband bought for me this perfume. At first I thought it was perfect because of its smell. but unfortunately it lasts max. and max. 30 minutes. Also, I don’t know how can it be so but eau de perfume was written on the box while eau de toilette was written on the button of the perfume glass. is it always so? plz waiting for your reply. Hmm, no, usually the bottle would also say Eau de Parfum. Perhaps take it back to the store and ask? It does seem odd. Who is the designer of the dress uma is wearing? Don’t know, but it would be pretty odd if it wasn’t Givenchy. LOL…yeah, you really need to start hating more new releases! I sprayed and tried this today. Honestly, the scent is odd… just odd. But I think I like it! Probably not enough to buy, but I’d wear it in a pinch. where can i buy that dress? or something very similar.